Wonderful Pistachios No Shells Roasted & Salted Pistachios, 6 Oz. 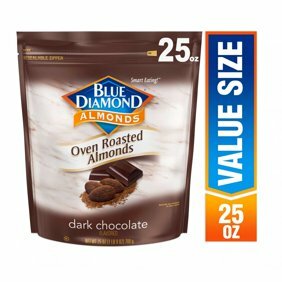 Blue Diamond Almonds Oven Roasted Dark Chocolate Almonds, 25 Oz. One 6 Ounce Resealable Pouch of our Roasted &amp; Salted Wonderful Pistachios Without the Shell. Roasted and Salted Wonderful Pistachios have literally come out of their shells. Same delicious taste, but with a little less work for you. Still great for snacking, they’re also a wonderful addition to your culinary creations. Wonderful Pistachios are a smart, healthy choice for folks around the world. Located in California’s fertile San Joaquin Valley, Wonderful Pistachios &amp; Almonds owns, cultivates and harvests more than 75,000 acres of pistachio and almond orchards, and delivers pounds of nuts globally each year. The warm days and cool nights work in harmony with the region’s natural soils to create the perfect growing climate. We then carefully tend and harvest each pistachio using the latest in sustainable practices. One 6 Ounce Resealable Pouch of our Roasted & Salted Wonderful Pistachios Without the Shell. Roasted and Salted Wonderful Pistachios have literally come out of their shells. Same delicious taste, but with a little less work for you. Still great for snacking, they’re also a wonderful addition to your culinary creations. Wonderful Pistachios are a smart, healthy choice for folks around the world. Located in California’s fertile San Joaquin Valley, Wonderful Pistachios & Almonds owns, cultivates and harvests more than 75,000 acres of pistachio and almond orchards, and delivers pounds of nuts globally each year. The warm days and cool nights work in harmony with the region’s natural soils to create the perfect growing climate. We then carefully tend and harvest each pistachio using the latest in sustainable practices. One 6 Ounce Resealable Pouch of our Roasted & Salted No Shells Wonderful Pistachios.These Wonderful Pistachios have come out of their shells. We do the crackin’, you do the snackin’.Gluten FreeNon-GMO Project VerifiedKosher CertifiedHalal CertifiedTHE FIT NUT: Fuel your fitness with The Fit Nut. They’re tasty little powerhouses of heart-healthy goodness.THE SKINNY NUT: Go ahead and indulge a little with The Skinny Nut. Known for fiber and protein, pistachios are deliciously fulfilling.THE MINDFUL NUT: Savor each moment with The Mindful Nut. Crack, relax and snack mindfully. Ohmmm.THE COLORFUL NUT: Add some color to your diet with The Colorful Nut. Fun fact: their green and red-purple hues come from vibrant antioxidants.THE HAPPY NUT: Go snack-happy with The Happy Nut. Once you crack one open, you’re sure to crack a smile. Shells may occasionally be present. Im so happy that i bought these pistachios, because in my neighborhood i can't find "shelled." I must say tonigh must be careful when eating them, you will find the remnants of an occasional shell of you eat them like me!! I grab a handful an POP THEM IN M MOUTH! Delicious!!! I am getting spoiled to eating the already shelled pistachios since ordering these. And have just ordered more for my daily afternoon snack. I may never go back to snap cracking pistachios shells again!! My sister gave me a bag of these shelled, roasted pistachios and I put them in my salad. What a good taste! Then I took a salad to a party and everyone raved about the new addition. I went to my usual grocery store to get some more but could not locate them. So I got online and searched and Walmart had them! I had no idea! So I had them shipped to my home and they arrived safe and sound and I didn't have a long wait either! Yum! excellent sort of protien and great flavor. Much cheaper than the ones in the shell. Fresh and oh so good.